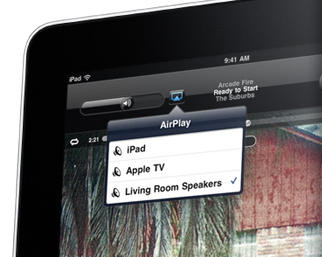 I was handed an iPad and asked, “Where did the AirPlay button go?” That’s a good question. The iPad was loaded with iOS 4.2.1 and AirPlay was working fine, but now the button was missing from all of the apps on which it was once available. I took my own iPad out to make sure it was still there. It was. Both iPads were upgraded on the same day to 4.2.1. Both iPads used the same network to stream to the same AppleTV. You may have seen the demo. Yet his iPad doesn’t have the AirPlay button, and mine does. I tried the Video app, iPod app, YouTube app, Netflix, and Photos. None of the apps had the AirPlay button they once had. I did a bit of snooping online, and found a few other people with the same problem. 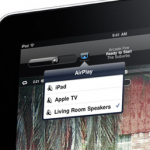 Did Apple roll out AirPlay prematurely? This Apple Support forum thread points to a bug when the language is changed on the device. Changing language (English > French > English) brought back the AirPlay icon on iPod on my iPhone 3Gs v4.2.1. It came back on the first switch to French, and also when I switched back to English. Prior suggestions of rebooting did not correct the situation. This seems out of character for Apple, who has a long history of reliable software. The AirPlay button does not appear on the device while it is connected to 3G. AirPlay requires a WiFi or Bluetooth connection. This iPad didn’t automatically switch to WiFi, so I manually switched it and the button reappeared. This seems like the the same problem other people have had. Their solutions must have reset their connection to WiFi. We have had some issues where the Airplay button disappears on an iPhone or iPad, and it usually returns after a reboot. I found the answer. The iPad was connected to 3G, not WiFi. I’ve tried all those fixes and I still am not getting my airplay icon to appear. Any other fixes? Tried all the fixes listed, not had airplay for the last 5 days. very annoying. Colin, which model do you have? Nothing works, I lost the Apple TV words, the air play, mirroring, all of it. I tried rebooting, turning off wifi, nothing seems to work. HELP!